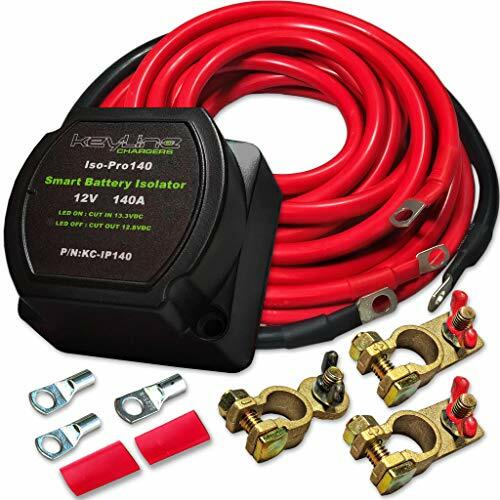 A great way to charge dual batteries while on the road is through a battery isolator. An isolator basically sends a charge to the auxiliary battery, from the alternator, after the starter battery is charged. I bought the Keyline Dual Battery Isolator on Amazon. This kit is great. It comes with tons of battery cable. I recommend it for the amount of wire they give you alone. So, this is a very easy set up. I will walk you through step by step. This seems like a daunting task but it’s actually quite easy and I enjoyed learning along the way. For once, a convenient placement for battery right at arms reach under the driver seat. This makes the job so much easier. Disconnect the car starter ground cable. Make sure you have a solid ground connection on your auxiliary battery. Check by putting it in two different grounds and checking a volt meter to see if the volts remain the same. Get 2 x 100 Amp inline fuses either here from Amazon or at your local car stereo store. Measure all the wire distances. You will need to cut them. You need one positive wire running from your Isolator to your starter battery. The other positive will run from the isolator to the auxiliary battery. Be sure to give yourself ample room. Strip, crimp, and heat shrink your wires, with the provided terminals. I didn't have a crimper for the large terminals. So, I used a vice and it worked great. Connect all your inline fuses to your wires. Connect the isolator ground, then starter battery terminals, and last, connect the auxiliary battery terminals. Connect the ground terminal back on the starter battery. After this, make sure that the isolator cuts off by turning the car off and turning the head lights on for a sec (to speed up the process otherwise you have to wait till the volts drop below 12.8 and the isolator will stop charging. **Don’t forget to turn your lights off. ;) You will hear a light humming noise once it stops your isolator should cut off. You should see the isolator light turn off. Check the batteries voltage. It should be down to 12.8 or below and should remain constant.